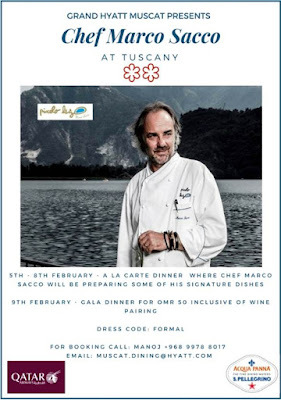 For those of you who enjoy fine dining, there is a visiting chef in Tuscany this week, Chef Marco Sacco - who has earned 2 Michelin stars at his restaurant Piccolo Lago in Italy of course. Between tonight (5th Feb) and Thursday (8th) Chef Marco and his assistant with the support of the Tuscany kitchen will be knocking out some of his signature dishes, and then on Friday night (the 9th) for those of you interested, there is a fixed price of RO 50 a head which includes "wine pairings". Posh nosh! And with this weather right now, dining on the Tuscany terrace will be something special.